Sources within the music industry say Apple is pushing major record labels to offer exclusive content on iTunes, which would be sold using windowing strategies to boost slumping track and album sales. 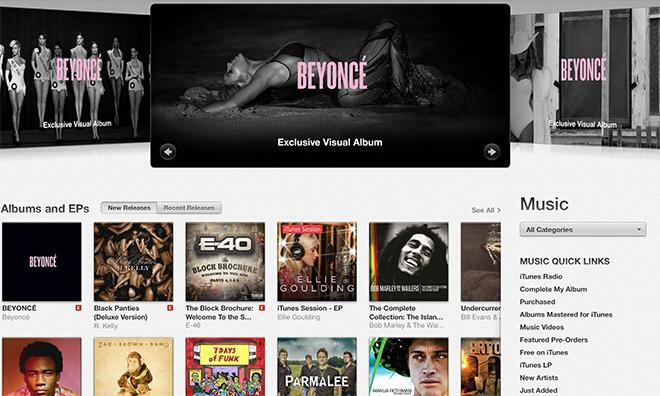 Apple's iTunes music store as seen on the release of Beyonce's latest album. According to Billboard, people familiar with Apple's recent moves said iTunes director Robert Kondrk has been aggressively going after labels to release exclusive content. The model would be similar to that of Beyonce's highly successful "visual album" released late last year. In December, Beyonce dropped her self-titled album on iTunes and kept it an Apple exclusive for one week. Sold as a full album with 14 songs and 17 accompanying videos, "BEYONCE" moved over 800,000 copies worldwide in just three days, a record for Apple. Key to the so-called "visual album's" success was the windowed sales strategy employed by Beyonce's Parkwood Entertainment and Columbia Records, which kept single tracks off streaming services until the second week of availability. The singer even kept YouTube videos to a minimum and only offered 30-second teasers at launch. Windowing is used in a number of consumable content industries as a means to spur sales. A good example of the strategy is the sale of hardcover books, which bring in more money for publishers than the cheaper softcover versions released a few weeks later. Sources claim Kondrk engaged in discussions during Grammy Week in January to push major labels to release new albums under similar sales models. The executive even suggested that new albums did not have to be iTunes exclusives as long as streaming services were shut out, the people said. "The iTunes theory was that because of the easy availability to access albums on YouTube it has punctured sales globally for track and albums," said an unnamed executive from a major record label. Kondrk also asked that individual tracks be windowed for a certain period before being sold separately from the full album and before being made available to streaming services. This is counter to the original iTunes model that sought to disrupt the space by breaking up albums and selling tracks individually.